Devonshire House preparatory school is a co-educational independent day school for children from 21⁄2 to 13. The School occupies four large Victorian houses in Arkwright Road and Fitzjohn's Avenue, Hampstead. Crawford and Gray designed and detailed a new Information and communications technology (ICT) suite by extending the School hall, located at the rear of school site on Arkwright Road. The works carried out entailed strengthen the existing structure of the hall and erect the extension using off-site construction methods to fit a very tight programme within the 8 weeks school's summer break. 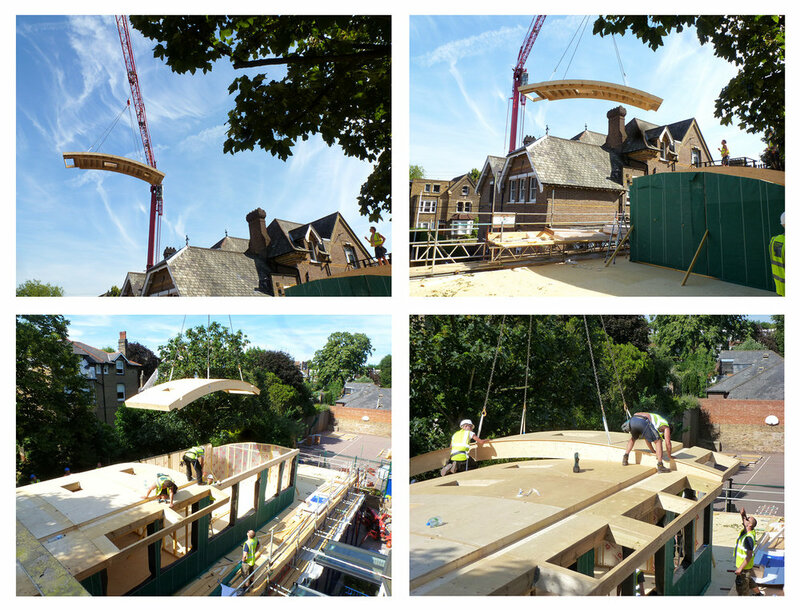 Due to the restricted access, the insulated timber panels forming the walls and the curved roof had to be craned above the main school buildings and carefully moved into position. As part of the project, an extensive green roof was installed onto the existing halls roof and green walls onto the two end walls of the new building.